Brownie Hero – I'll Make It Myself! “What is your favorite American food?” a student asks. “Brownies!” my Japanese coworker says. “Definitely brownies,” I add. Monday was Valentines’ Day, and, in Japan, that means bringing the men of the office chocolate. I decided to go American-style and bring in something for everyone, figuring it could be an intercultural teaching moment. Interestingly, my coworkers all had the same idea, and several of my superiors even donated to my personal chocolate fund. I made off with a Royce chocolate manjû and a Black Thunder mini bar. I could have done the Japanese thing and melted down chocolate into heart-shaped molds to pass out, but I’ve been on an American food kick lately, and my coworker’s love of brownies reminded me of that little something missing from my life. 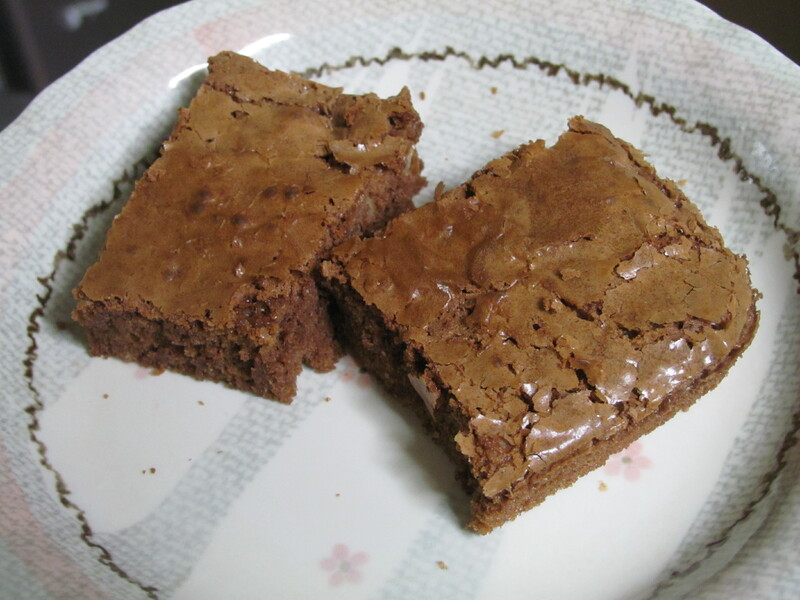 I love brownies, but I refuse to drop 500 yen on an imported box of brownie mix. Brownie mixes are comparatively inoffensive on the “oh, god, I am eating preservatives with a fork” scale (I’m looking at you, store-bought icing), but why bother hunting one down at an import store and paying triple the price when baking chocolate is plentiful here? The real reason I had avoided the brownie mixes was the logistics of baking the brownies. In the US, whether it’s boxed or homemade, whatever you choose goes into the oven. In Japan, adapting American baked desserts, particularly cakes, requires creativity. (You can, of course, purchase muffin mix and cookie mix, but that would not be in the spirit of this blog, now would it?) Lacking a conventional oven, most of us expats use an “oven range,” or moven, which is a convection oven with a microwave function and a toaster built in. Not only is my standard model National Brand oven range too small for a 13×9 inch cake pan (that’s 33×23 cm), the convection style heats in such a fashion that getting the middle of cakes and bread done is quite a task. I’ve discovered that halving a (13×9) cake recipe tends to work best, as a brownie pan (8×8 in, or 20×20 cm), which actually fits in my oven range, is about half the volume of a 13×9. This is really a case-by-case situation, though. I’ve had half-cakes come out in that very special™ half-baked gooey manner or flat as a pancake because I misjudged the volume–and it’s not just the volume of the batter but the final volume of the cake that matters. The chocolate sinks to the bottom, which is kind of neat, but it's not the same. My other method for dealing with baked goods is to use Japanese recipes, which are, of course, meant for oven ranges. I have this great book of cakes and breads you can make in the rice-cooker called 『炊飯器でおいしいお菓子＆ふっくらパン』, but the recipe for brownies just wasn’t right. 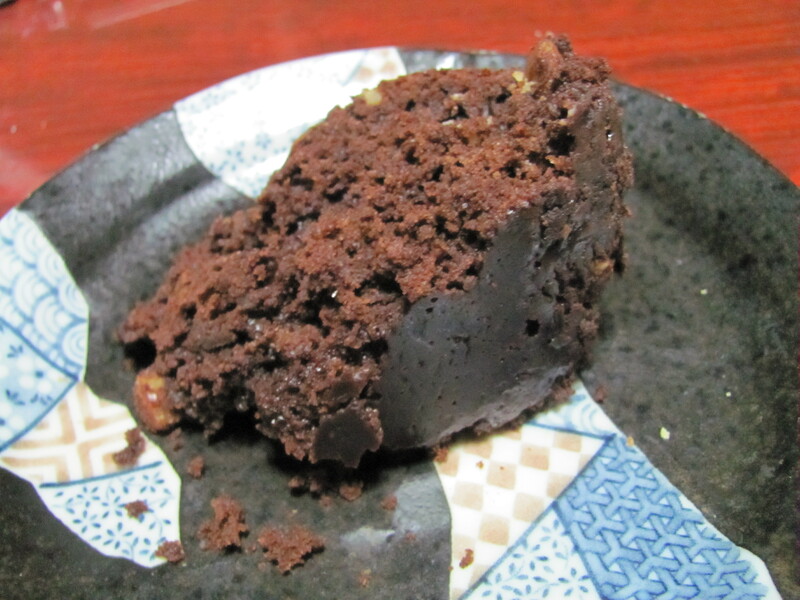 The ingredients are pretty much the same, but the batter steamed in a rice cooker just makes a chocolate cake, really–it’s round and dense; it lacks the flatness and flaky top that makes brownies what they are. This is some kind of 和風 brownie. The hamburg steak of brownies, if you will. Sure, it tastes fine, but feels like an attempt to pass off some Japanese Western food as something Americans eat all the time. File that recipe under “cake” and move on. Luckily, The Joy of Cooking‘s “Brownies Cockaigne,” with its lack of rising agents, was perfect for halving. You’re probably going to want ALL the brownies and the cook time is fairly short, so this recipe is for the whole batch–halve it into two pans. American readers, if you do not own The Joy of Cooking, get to a bookstore and get a copy. Based on “Brownies Cockaigne” in The Joy of Cooking. Makes ~25 small brownies between the two pans. Optional: 50-125 grams [1/3 – 1 cup] chopped walnuts (nama kurumi, 生くるみ) – I used about 50 grams but wanted more! 1. Cut up the butter into chunks and heat in a small saucepan over a low flame. Break up the chocolate, then add it to the pan and heat gently until melted. 2. Let the butter and chocolate mixture cool, or your brownies will turn out awkwardly. 3. Beat the eggs and sugar until light and foamy. 4. Gradually add the flour and vanilla/rum flavoring and beat until the batter thickens. 5. Fold in cooled chocolate mixture with a spoon (Joy recommends a wooden one) just until combined. 6. Gently stir in the walnuts. 7. Halve batter and scrape into 2 lightly greased pans. Bake each for 25-30 minutes at 180 C (350 F). Pingback: Double Coconut Brownies (Dairy-Free) | I'll Make It Myself!